As Language permeates all aspects of life, it naturally fills activities and life in the Montessori classroom. Vocabulary is communicated and reviewed throughout lessons to help your child develop a ready command of our language from the onset of their Montessori education. The Language area, proper, offers multi-sensory manipulatives—sandpaper letters, etc.—to introduce individual phonetic sounds and letter shapes. These sandpaper letters are finger-traced in conjunction with an auditory lesson to prompt sound and shape recognition. 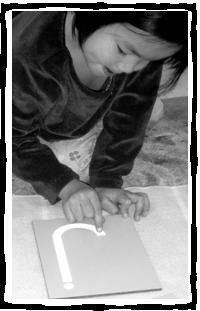 Reading is initially practiced by building 3-4 letter phonetic words using a movable alphabet. Grammar is explored by labeling nouns, acting out verbs and physically demonstrating prepositions. Writing is practiced through a series of exercises that develop control of your youngster’s hand muscles. All these applied lessons simultaneously engage your child’s mind and body to breathe life into the language your child now owns and is beginning to comprehend. Mastery is a ready result of repetition and involvement.